You will be given a reference e-book to read which has 251 pages And the test will be based on that e-book , you can take final test within 1 year of purchase. Information assurance refers to that practice which focuses more on managing risks and assuring information associated to using, storing, processing and transmitting data or information. It also encompasses the processes and systems that are used in the practice. It is important for you to note that while this practice focuses more in digital information, it also covers analog or physical information. Information assurance is also associated to the information security field since it also works in protecting information systems and the stored contents in them. It should also be noted, however, that the practice is more focused on strategic risk management of systems instead of creating and applying security controls. It also works in protecting information systems from malicious hackers and viruses while also taking into consideration corporate governance issues including regulatory and standards compliance and privacy. It is also concerned about business continuity, disaster recovery and auditing when linked to information systems. If you want to become an information assurance expert, then you have to remember that this is an interdisciplinary field which requires skills, knowledge and expertise in forensic science, fraud examination, management science, accounting, security engineering, criminology, systems engineering and computer science. It is also important for you to remember that there are numerous models that are now used in practicing information assurance especially in defining the requirements for assurance and in offering assistance when it comes to covering its vital aspects and attributes. All these models are capable of addressing essential attributes of information and its systems including integrity, availability and confidentiality. 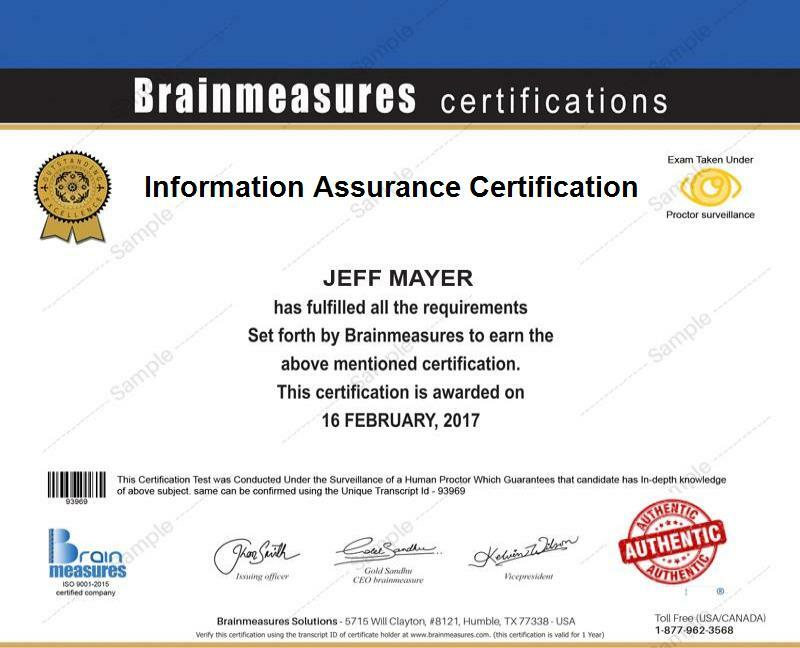 Being an information assurance expert is no longer that hard at present because of the existence of the information assurance certification program at Brainmeasures. The information assurance course which is now available at Brainmeasures is developed in such a way that it never fails to satisfy your desire to completely understand how information assurance works. By enrolling in this online certification course, you will be able to access an information assurance training which encompasses the most vital aspects associated to assuring information and managing its risks, protecting information from threats and improving the level of security for different kinds of operating systems, databases, routers and applications that store information. You can also expect this certification course to offer you a more comprehensive guide when it comes to implementing the information assurance process. As soon as your information assurance certificate is already received, you can start performing certain information assurance tasks with more confidence. The information assurance certification program which is now available at Brainmeasures is comprehensive enough that it continues to satisfy the need of all aspiring information assurance experts to learn. You can expect this certification course to work even more suitably for individuals and professionals who are responsible in the design and implementation of information security management process including information assurance managers, information systems managers and information security analysts. A great improvement in your financial stability can also be expected after you take a hold of your information assurance certification. As an information assurance certification holder, you can increase your chances of getting the position of an information assurance manager which usually offers an annual salary within the range of $50,000 to $103,000. You can also work as a network security engineer which can reward you with an annual pay of approximately $75,000 to $123,000.